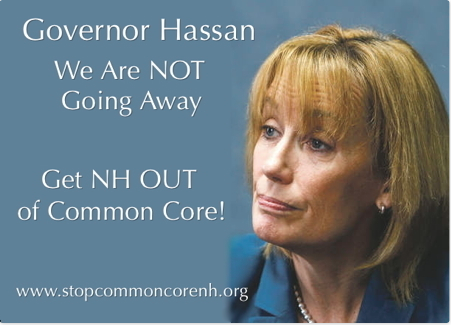 While Governor Hassan Throws Your Kids Under the Bus…..
Teachers and administrators can finally speak their minds, now that the Governor Herbert (Utah) admitted that his own grandchildren and children hate Common Core, and that the Common Core represents a loss of local freedoms. This is great news, even if he’s motivated (at least in part) by the highly successful campaigning of his opponent, Jonathan Johnson, on the ‪#‎StopFedEd‬ and ‪#‎StopStudentDataMining‬ and ‪#‎StopCommonCore‬ issues. After spending the past six years promoting, marketing, and providing workforce alignment strategies to serve Common Core, and after rising to the throne of Common Core’s organization, National Governors Association, to become its chair, and after going out of his way to have the Utah Attorney General provide “proof” that Common Core supposedly represented local control– after all of this, Herbert has now turned his back on the Common Core and has written a letter to the State School Board, asking it to move away from Common Core. This entry was posted in Candidates, Political and tagged Commoncore, Governor, GovernorHerbert, NationalGovernorsAssociation, NGA, Utah on May 11, 2016 by SCC.